Most of us have our camera rigs to hold everything nice and tightly in place. The only thing that isn’t held safely in those rigs is the HDMI cable. 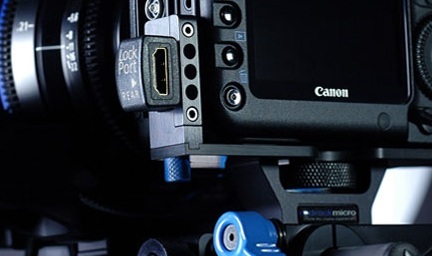 Problem is, with all the jarring around it gets from monitors, EVFs and the like, it can wear down on your HDMI port. Replacing this port can cost over $1000! Sure Viewfactor and Zacuto have their own clamps that are designed to work with their rigs, but nothing to work with other camera rigs. Thankfully LockCircle, makers of the luxury body caps, are coming out with the LockPort. The first iteration of their design will integrate with existing Redrock rigs, however their “Universal” model will work with any camera setup. The LockPort5 will work with the 5D with a future 7 model to come out for 7D cameras. When and how much? Could be a great product. YES! Thank god, right now I’m actually modifying my rig, and my cheek keeps pushing the cable, this is actually perfect.